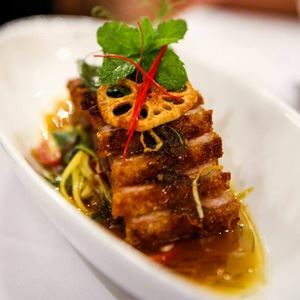 Twice roasted pork belly, caramelised palm sugar, fish sauce, green mango and Thai herb salad. For an elegant Thai fusion dining experience, visit Dusit Dheva on James Street in Northbridge. Black wrought iron screens and mood lighting invite guests into a contemporary ambiance, paired with Asian fare combining flavours and inspiration from traditional and Western influences. 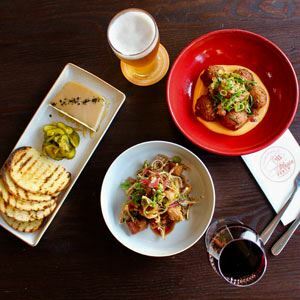 A warm vibe greets diners taking them on a tantalising taste journey, ideal for any occasion or group outing. Salivate over a starter of soft shell crab with watermelon, shallots, mint, coriander, chilli and lime dressing; or indulge the senses with hot and sour soup, tiger prawns and mushroom. 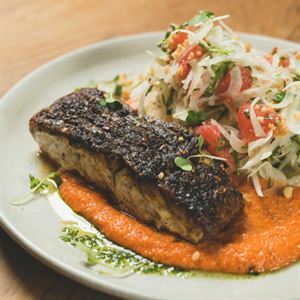 Mains like seared salmon and scallops with grapefruit, roasted cashews, herb salad, lime and soy dressing may entice; while vegetarians may be tempted by deep fried tofu with housemade sweet and sour sauce and pineapple.